Literary agent Peter Katz is intrigued by a partial book submission he has just received. 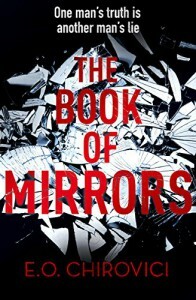 The submission, entitled The Book of Mirrors, tells the story of the author's time as an English student at Princeton during the late 1980's. The author, Richard Flynn, documents his relationship with the protégée of the famous Professor Joseph Wieder. But just before Christmas, Weider was murdered in his home and the case was never solved. Twenty-five years have passed since then and Peter Katz suspects that Richard Flynn is either going to confess to the murder or reveal who it was that did it. But the manuscript ends abruptly and Richard Flynn is in the hospital, dying, and the remaining pages are nowhere to be found. I'm giving this a generous three stars. I liked so many things - a book within a book, memories, the stories we choose to tell others and the ones we keep hidden, the unsolved murder of a popular professor. But all of these things didn't come together as well as I hoped they would. It started off good, but it became boring fairly early on. I was patiently waiting for that extra oomph where something would happen and the story would take off. But nothing ever really did happen. The characters were okay and the ending was just okay.